It was a very busy and long weekend. Not that I’m complaining. The weather was awesome today, but all I wanted to do was bake and take advantage of being home on a day filled with sunlight so I could take more pictures of food during the day. Alas, that didn’t happen. On the plus side, we did file our taxes. And taking pictures at night was okay because I was able to play with moving around light sources for maximum advantage. Plus I was able to use our leather chair as a background for the pretzels! 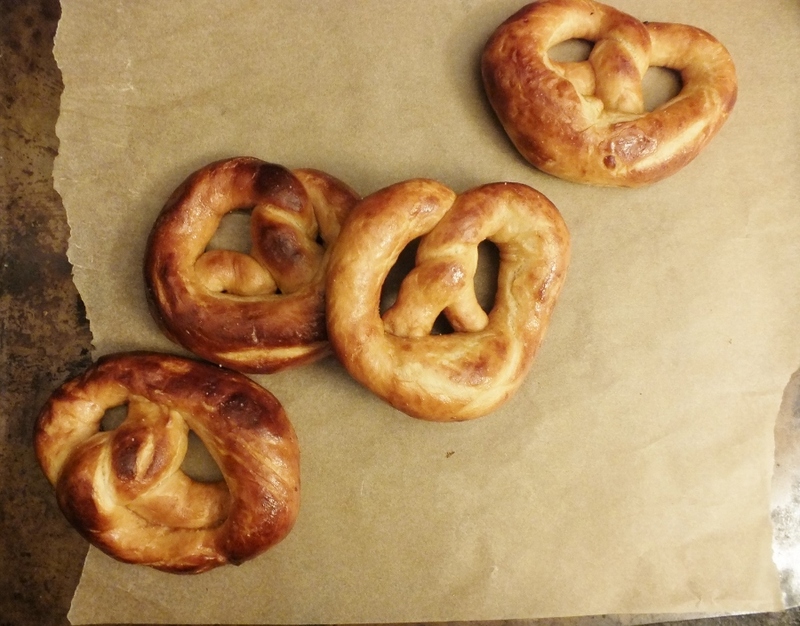 This is my first attempt at making pretzels. I think I did fine. Barley malt syrup is my new favorite thing. I’ll have to explore what else I can use it in. 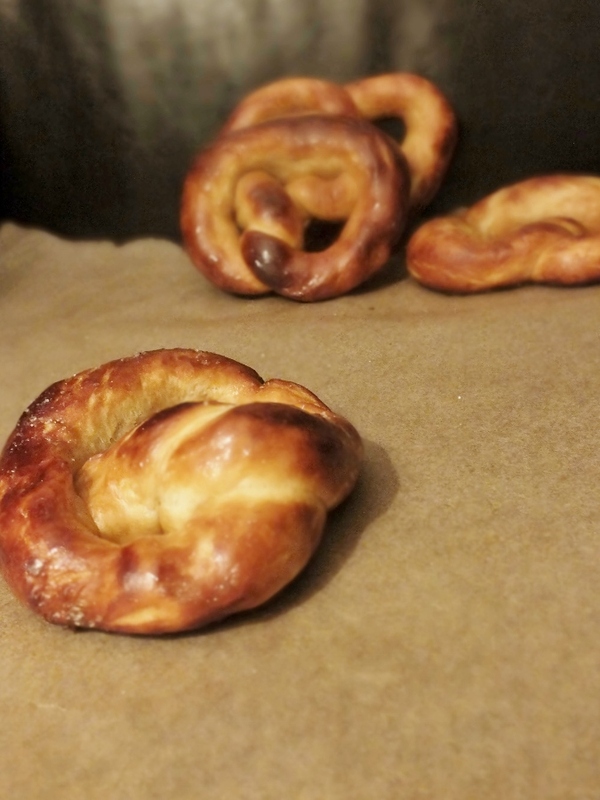 Next time, however, I think I will try harder to shape the pretzels thinner and longer around the knot so that they look more like pretzels. 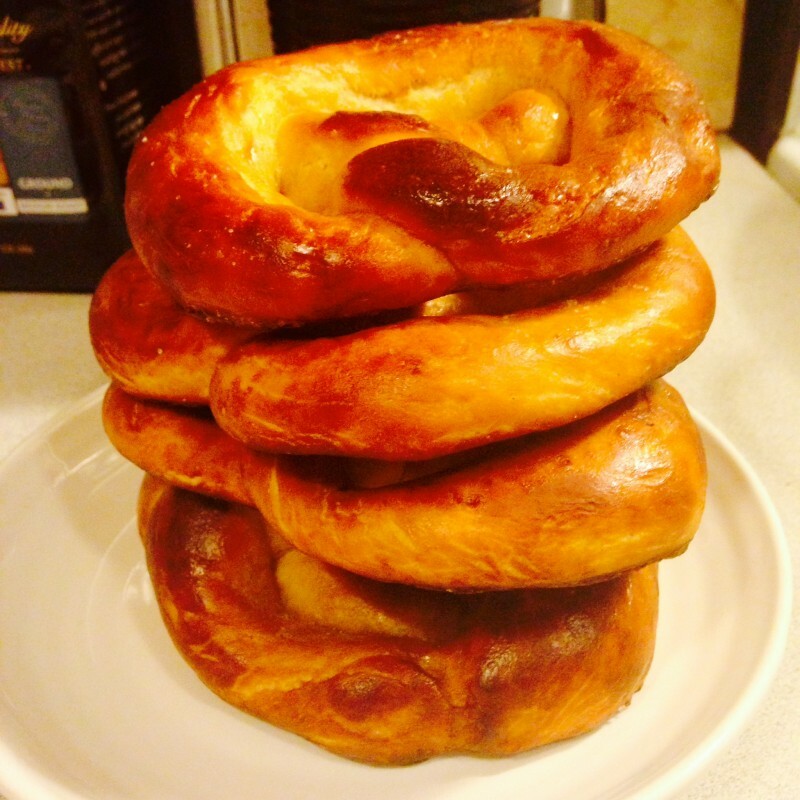 After all, the name of the recipe in the book is “Baker’s Sign Pretzels”. Place the milk in a medium bowl and stir in the yeast to dissolve it well. Add the malt syrup and 1 cup of the flour and stir until you have a smooth batter. Sprinkle on the salt, add the butter, and stir well to incorporate. Add the remaining 1 1/4 cups flour and stir and turn the dough to incorporate it. Turn out onto a floured surface and knead for 5 minutes, incorporating more flour as necessary. Place the dough in a clean bowl, cover with plastic and let rise for 1 1/2 hours, or until smooth, softened, about doubled in volume. Place a rack in the upper third of the oven and place a baking stone or unglazed quarry tiles, if you have them, (or a baking sheet) on it. Preheat the oven to 450 degrees F.
Turn the dough out onto a very lightly floured work surface. Cut into 4 equal pieces and cut each piece in half. Place a parchment paper-lined baking sheet next to your work surface. Work with 2 pieces of dough at a time, keeping the remaining pieces covered with a cotton cloth. Roll each piece of dough out under your palms to a long skinny rope, 24 to 30 inches long, slightly fatter in the middle and very thing at the ends. Press down lightly and push outward toward the ends with both hands as you roll, encouraging the dough to lengthen and stretch. You will find the dough very elastic, and that it springs back and shortens after you let it go, so switch back and forth between the 2 pieces. This will give the gluten strands in the dough an opportunity to relax a little. 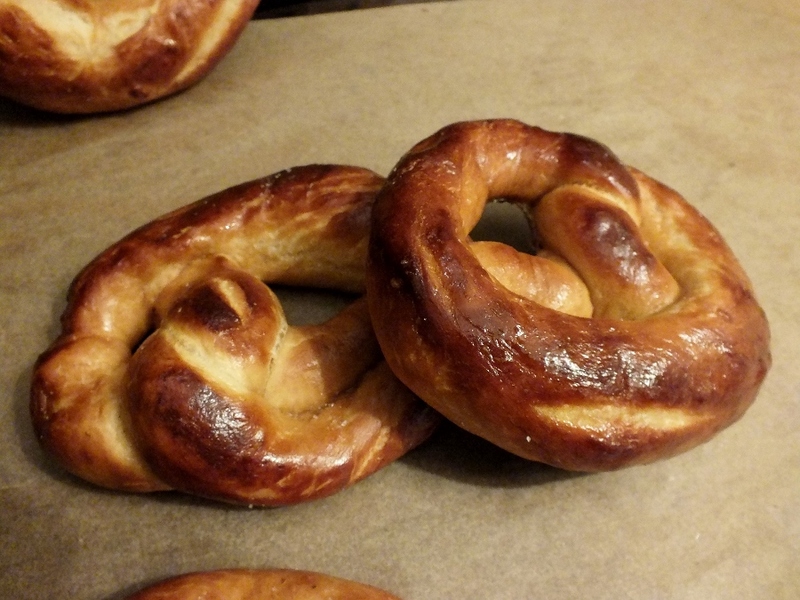 Once you have a long rope, pick up 1 end with each hand and twist 1 around the other once or twice about 2 inches from the ends, then lay the dough down in a curve on the baking sheet and lay the ends onto the fatter center of the curve to make the classic pretzel shape. Cover lightly while you shape the remaining pretzels. Let the pretzels rise for about 10 minutes. Meanwhile, heat 1 cup of water in a large saucepan until almost boiling. Add the baking soda and stir well to dissolve. Keep the water simmering until just before ready to use. Have a flour-dusted peel (or back of a baking sheet) near your work surface, and a razor blade or sharp knife for slashing the dough. 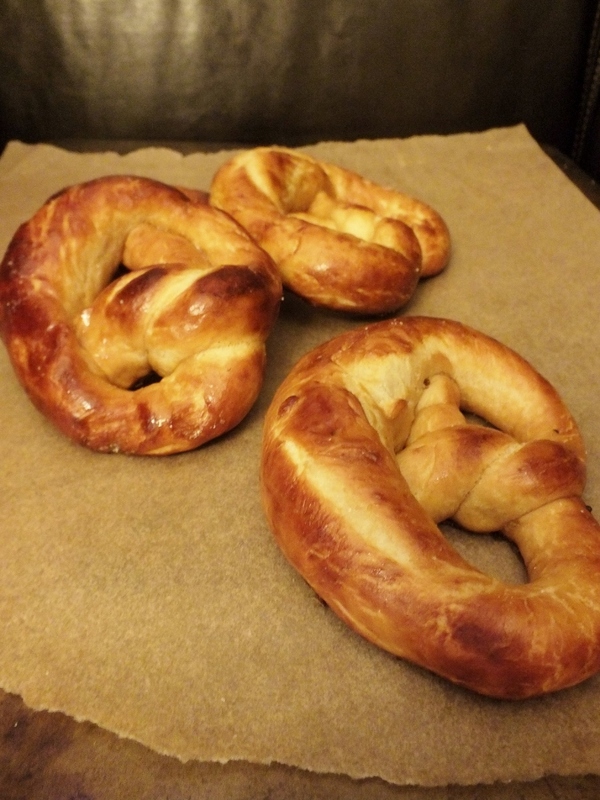 Bake the pretzels for 10 to 12 minutes, until a deep golden brown on top. Place on a rack to cool. Serve warm or at room temperature. 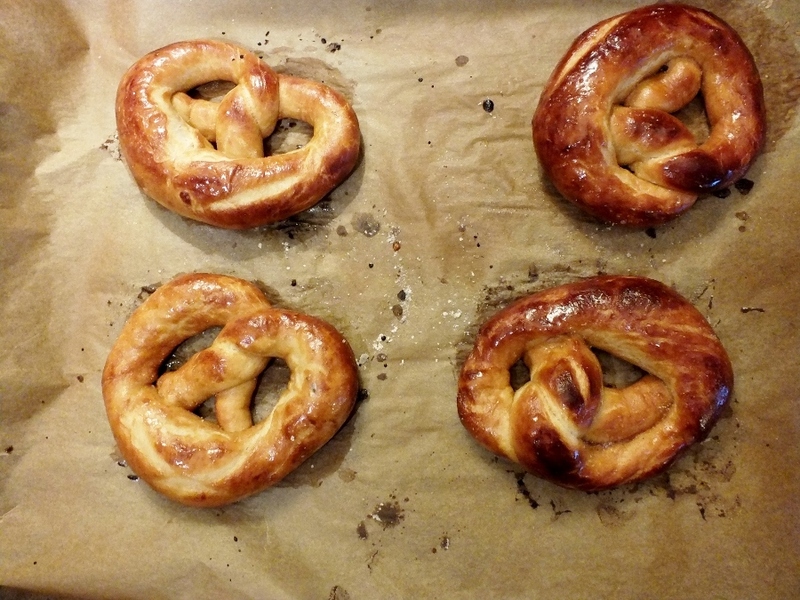 Note: If you’d like a little coarse salt on your pretzels, sprinkle on a pinch right after you slash each one. This entry was posted in baked goods, baking, pretzels, yeast breads and tagged baked goods, baking, prestzels, yeast breads. Bookmark the permalink.